I went to see Inside Job, a terrifying film, last night: how the ‘bankers’ (that actually seems to be a euphemism) looted their own companies, bribing, via jobs and consultancies, the (non-)regulators to make sure that a) they got away with it; and b) nothing changed so that they can now do it all over again. Today, UKUncut is having ‘bail-ins’ all over Britain, under their motto, ‘Too small to fail!’ If the depredations of the banking sector have wreaked such havoc on civil society that care centres, libraries, early-learning centres and creches are forced to close, the logical thing is to move these civic groups into the banks and other spaces that have decided they can bail out — that they are above the needs of society. 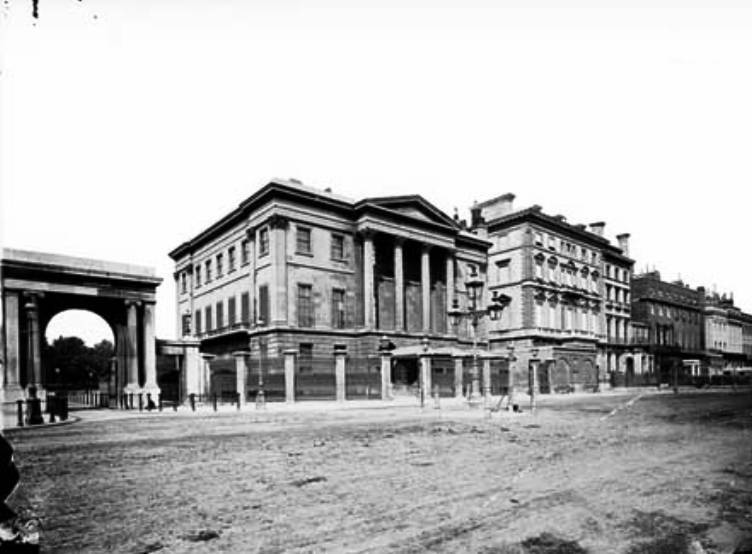 This picture of Apsley House in the 19th century (below) seems to have no connection with the above, but it is actually an object lesson in the need for the ruling classes to have some engagement with and responsibility to the population at large. Apsley House was the home of the Duke of Wellington, the Iron Duke, conqueror of Napoleon and perfectly terrible politician. In the photograph you can just see that the windows on the ground and first floor are shuttered. These are iron shutters that permanently covered the windows after 1831: when Wellington killed off the Reform Bill, crowds gathered outside, throwing stones at the building and breaking a few windows. He had the iron shutters put up, and left them there, permanently closed, until his death in 1852, despite the fact that the Reform Bill passed in 1832. It was, in effect, a sign of disdain — a ‘remember how dangerous and ghastly the people are’ gesture. But history remembers differently: the Reform Bill passed. And the Iron Duke sat in the dark. This entry was posted in Blog and tagged 19th century, 19th century photographs, UKUncut, Victorian by inspectorbucket. Bookmark the permalink.